Mongolians use eagles and falcons to hunt foxes and hare in the cold winter months when it’s easy to spot these animals in the white snow. 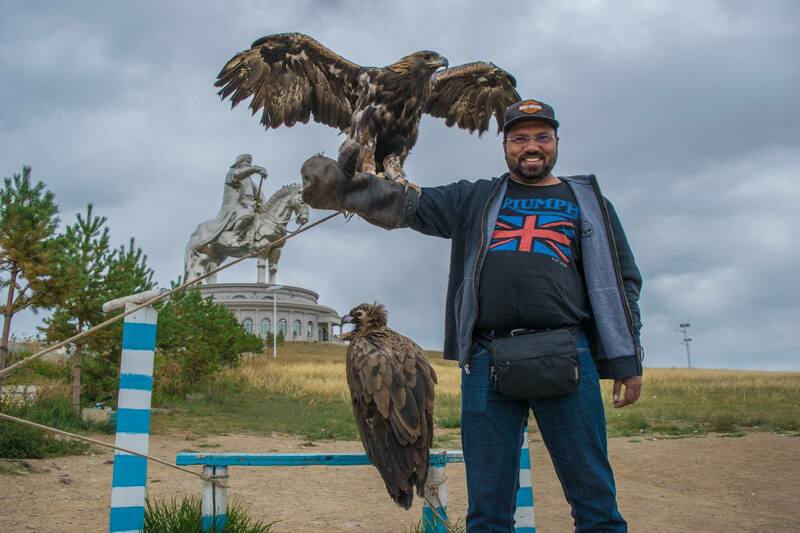 Near the parking lot of the Genghis Khan statue complex, there was a man with an eagle and I posed for a picture. The man slid a leather glove over my right hand and asked me to hold it outstretched. Then he picked up the eagle, whose leg was tethered to a post by a thin rope, and placed the bird on the glove. The bird was quite heavy and the man asked me to shake my hand up and down. I couldn’t understand why. I really didn’t want to piss off an eagle that was within striking distance of my face. So I stood as still as I could with my arm outstretched. My tour guide explained that shaking the bird up and down messes with the birds balance and it opens its wings to fix the problem. That resulted in good pictures. I decided that it was worth a shot and started shaking my hand up and down rather violently. The trick worked and the eagle started flapping its wings to stop falling off my hand. My guide managed to click a bunch of pictures. After a while I stopped, partly because my hand was aching, but more because the eagle had begun slapping my head with its left wing. I didn’t like where things were heading. I got my eagle picture with the Genghis Khan statue in the background. I didn’t want to push my luck with the eagle, who I assumed was tormented many times a day by people shaking the crap out of it. What Is A Mongolian Ger?